Well, the computer did start this morning. As did I, a lot earlier than expected. Unfortunately, hot on the heels of last week's sudden outbreak of chickenpox, Toby's gone down with croup. Frankly he couldn't be any croupier without joining a casino. It's a lot like having a sea lion in the house, and makes sleeping somewhat difficult. I've been lying awake, worrying he'll eat all my tuna. 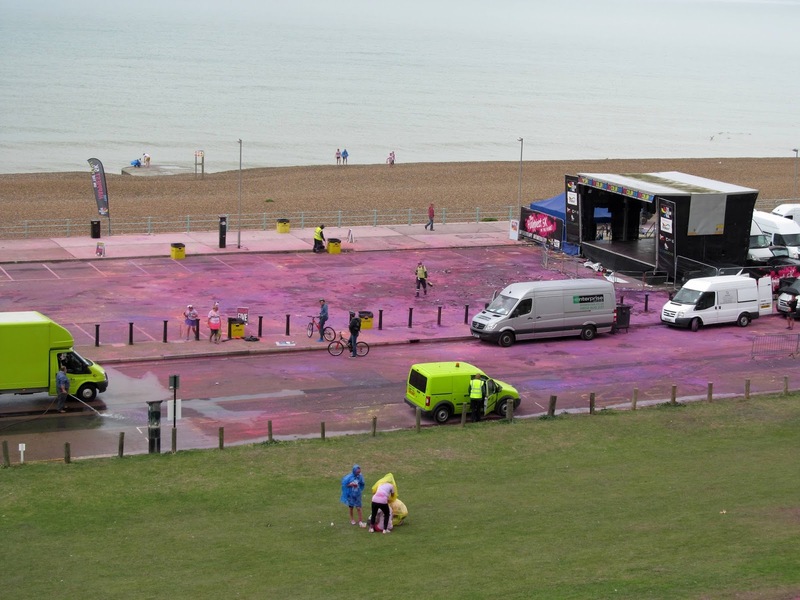 Dozens of council workers armed with hoses and brooms were busy scrubbing pink paint off the seafront, while various paint-stained individuals attempted to wash themselves in the sea and change into other clothes. As we ventured further into the marina, we kept passing weary-looking groups of people in colour-spattered clothes, staring despondently at their formerly white trainers. At the time, I thought Asda must have sold out of Vanish, but as it transpired, we’d just missed The Dulux Color Run, a five-kilometre fun (that's a subjective word) run which, according to their website, "celebrates healthiness, happiness, individuality, and giving back to the community". Although most of the participants I saw looked pretty miserable, were all the same colour, and had left the council to clean up their mess. As I understand it (and I'm not sure I do), the aim of The Color Run is to allow people to experience life as a Conservative minister touring a deprived inner city council estate. You basically have to keep going for half an hour while coloured people throw paint at you. And they charge entrants £25 for the privilege. Frankly they can come round to our flat for a tenner and do some artwork with Amelie. It amounts to the same thing. I'll even give some of it to charity. But only if the Marie Curie shop has some nice shirts in. Anyhoo, having been through a purple patch in the afternoon, things took a turn for the worse yesterday evening. Toby had gone to bed at seven, but by eight o'clock we were convinced he'd smuggled a seal into his cot. He wasn't coughing, but he was crying, and every intake of breath sounded like feeding time at SeaWorld. A quick look at the NHS website revealed his symptoms to be classic signs of croup, which apparently strikes between the ages of 6 months and 5 years, affects boys more than girls, is most prevalent in autumn, much worse at night, and makes you sound like a barking seal. It also gives you something called 'stridor', so called because it makes your voice sound a tinchy bit rasping. Reassuringly, the NHS website states that "It is very rare for a child to die from croup", which made us all feel a lot better, and we're currently playing it by ear, and deciding whether to get him to a doctor or just toss him a few sardines. To be honest, he seems a lot better since the sun came up. His nose is running more than a Dulux sponsored event, but he's having no trouble breathing. Personally though, I'm taking no chances. I was due to look after Toby today while Lisa took Amelie for a two-hour swimming lesson, but in light of our son's current health problems, I insisted we swap roles. 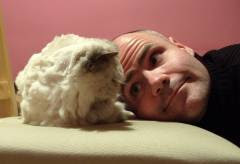 Toby might be barking, but I'm not. So I've been writing this at poolside on my netbook, while looking up every two minutes to check that Amelie hasn't drowned. I must remember to thank Paul Smith for his free wi-fi.